8. Public transportation. 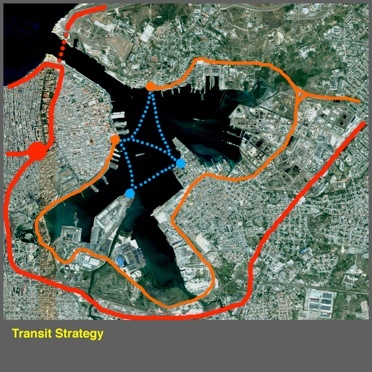 A public transportation system must be envisioned to connect the whole site and to provide access to all areas. 9. Safe environment. Pollution must be eliminated as part of the sanitation of the bay and the rivers. 10. Social and cultural integration. The city, the towns, the neighbourhoods must guarantee that there’s no social exclusion for any reasons and should provide access to cultural life and all its manifestations. 11. A long term vision. As everything is connected with everything else, then the approach should a comprehensive one, that which allows conceiving all the issues as a whole with a systemic approach coming from the general to the particular, zooming in processes, places, etc. 5. Open space must add value to both the waterfront and the city and must be defined by buildings that form a continuous urban edge with active ground floors uses related to them. 6. Gate to the city. The harbour site must become a gate to the city reinforcing this historic condition and giving Havana a new image in terms of both economy and urban values. 7. Green. The green must help weave visually and physically the whole area so it helps create a coherent landscape where architecture fits harmoniously. 3. Change of character. The transformation of the current industrial character of the harbour and its turning into a recreational, commercial and sport harbour. 4. New buildings respond to waterfront. The design of buildings that respond to the waterfront. The buildings must be a sensitive response to the place in terms of context, history, geography and building culture in a way that they become urban architecture and help place making and not be isolated objects. 2. Mixed use. The design of mixed use buildings to guarantee the vitality of the area at different times. Residential, cultural, commercial, office, hotel, entertainment and sports and leisure facilities are key uses to provide amenities able to redefine and give character to the site. 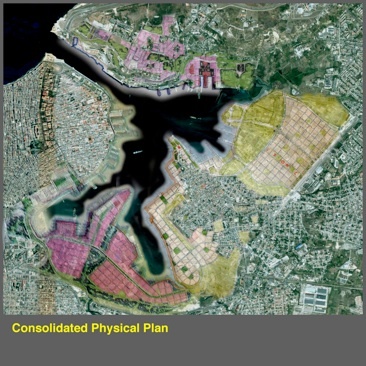 Working teams were formed based on both affinity and expertise to work in the different sectors of the harbour site related to the plan mentioned above. There were six teams in total, five of them concerning each of the sectors and an overseeing one led by Julio, Michael Mehaffy, Audun Engh and Claus Zapffe in charge of developing and explaining the overall concepts and general strategy for the project. The revitalization of the Havana waterfront is one of the key concepts stated in A Master Plan for XXI century Havana (1) and the Harbour Sector is one of the sectors defined in it. C.E.U. became aware of the Master Plan for XXI century Havana since 2004 when it was presented at the IV Bologna Triennale by its author Prof. Arch. Julio César Pérez Hernández, but the Charrette idea was firstly conceived by Audun Engh and Julio César Pérez in 2005 at the C.E.U. Congress in Berlin and later followed up through 2006 and publicly announced at the Venice Charter Revisited international conference held in Venice, Italy and at the Sustainable Urbanism international conference held in Leeds, England also in 2006. The Norwegian Chapter of C.E.U, represented by Claus Zapffe and Audun Engh,played a key role in the advertising and the back up of the Charrette from outside of Cuba and together with Julio César Pérez Hernández invited a number of prestigious professionals from all over the world to make this joint effort worth while. (1) A Master Plan for XXI century Havana is a comprehensive urban project conceived and developed by Prof. Arch.Julio César Pérez Hernández and his team.